Sources: Former New York City Mayor and former Ambassador to the UN are the leading candidates to be Secretary of State under Donald Trump. Former New York City Mayor Rudy Giuliani and former U.S. Ambassador to the UN John Bolton are the leading candidates to be Secretary of State under President-elect Donald Trump, two people familiar with the process told The Wall Street Journal on Monday. A final decision, however, could be several weeks away, according to the sources. 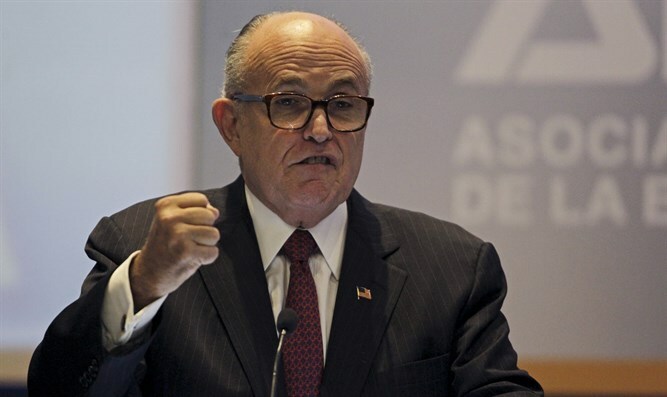 Giuliani is a close friend of Trump’s and, similar to Trump’s pledge during the election, recently said he hoped the next U.S. president would cancel the nuclear agreement with Iran. Giuliani is known for his staunch support for Israel, and has visited the Jewish state several times in the past. During his tenure as mayor of New York City, the city came under attack on September 11, 2001, and he told Arutz Sheva several months ago that Israel's conduct in the face of ongoing terror inspired him in the aftermath of those attacks. Bolton, too, has spoken out against the nuclear deal with Iran and, like Giuliani, is a strong supporter of Israel. Bolton declined to comment, and the Trump transition team didn’t respond to the Wall Street Journal’s question for comment.